Cheaper Car Hire at Phnom Penh Airport. 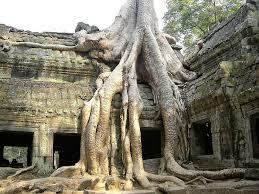 Get low cost rental for SUV, Minibus & MPV rental in Phnom Penh, Cambodia. 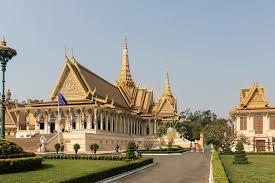 Conpare lower cost car hire at Phnom Penh Airport here and save money on the usual costs incurred. We use Avis for cheaper car hire, with all the insurance and roadside cover you need. Cars are driven on the right, but cannot be driven outside of Cambodia. You get a mileage allowance of 700kms before paying USD25 cents per km. is certainly a city on the up and well worth a weekend visit. Has the mighty Mekong running through it and the bars and restaurants on the banks make for a nice evening. This is helped by the open air nature and French style of the architecture. Bythiswe refer to the dark part of the Khmer Rouge history, where the monument at the Killing Fields and the school called S-21 provide a chilling reminder to what happened. 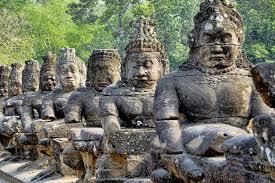 Check out the temples and markets of Phnom Penh or visit Siam Reap to view the magnificent temples of Angkor Wat. 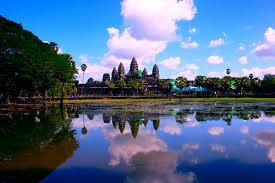 Over fifteen million Cambodians have Khmer as their official language. After you make a friend, you will call them using +855. The level of English spoken by Cambodians is quite good. Although the official currency is the Riel, this is not the currency you ask for when you head for the cambio exchange, as you will need a suitcase to carry them. What you will need is the US Dollar. However, when you buy anything in Cambodia, you will get Riel as the change, so try to have as close to the purchase price as possible in dollars. Use the Riel for tips. 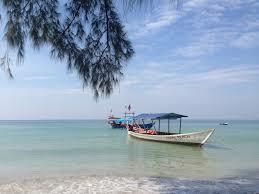 Book cheaper vehicles in Cambodia. Phnom Penh motoring in a MPV, or SUV, made simpler and faster. 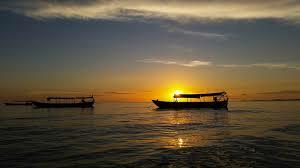 Compare discounted driving rates in Siam Reap. SUV, MPV at reduced rental rates. CDW excess cover available as optional extra. Drive to the beach in your rented minivan. 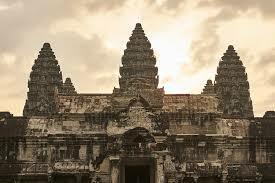 The home of Angkor Wat. You can fly to it, or get the river boat from Phnom Penh, but this takes at least half a day. Wake up early for sunrise over the Wat, as it is well worth it. There is also a fixed balloon you can go up in to watch the sunset, or anytime of day. The town has a unique feel as well, with many bars and restaurants. You need transport to get from the town to the Wat. There is the main big one that everyone knows about, but there are also many more smaller temples in the surrounding area that are worth a visit. Climbing some of the higher up steps can be scary and a challenge. The tree growing out of the wall is a favourite photo for everyone.